Theoretically, I should experiment more with dry rubs but, well, it’s just… for me, this stuff is like the grill equivalent of crack. Crack and pork. Pork and crack. I play around with ratios and leading actors, but I always come back to the same basic cast of characters. When these players hit the stage of Fleisher’s berkshire pork, spectacular things happen. 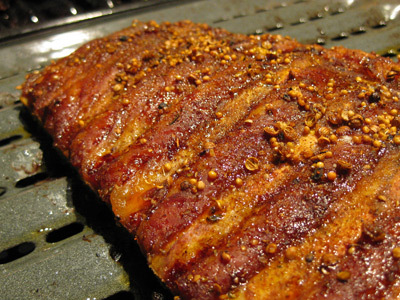 Buy two racks of (berkshire if possible) pork spare ribs for every 3 people. I sometimes use pre-ground cumin, but I really like using the seeds for the coriander, mustard seed, and black pepper for that extra texture. I also will note that I don’t bother removing the membrane on the bottom side of the ribs. 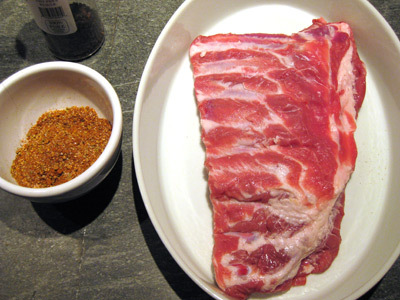 Rub the spice mixture all over the ribs, then place them in a suitable holder (I use a baking dish), cover with plastic wrap, and return to the fridge for 6 hours or more (overnight is ideal). You can cook these with indirect heat on the grill, or with low heat in the oven. In this case, it was raining, so I baked these on broiler trays (so any melted fat didn’t pool) for 3 to 3.5 hours at 250F degrees. That’s it. Easy peasy. Dig in caveman! 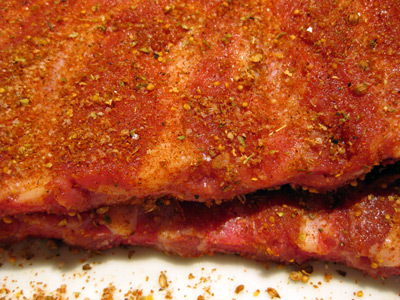 Additional notes: I usually don’t use oregano with this dry rub, but really enjoyed it here. Another good spin is to add some heat with cayenne or red pepper flakes.